Combine flour and baking powder in a bowl and set aside. Depending on size of cutters you should get approximately 25 cookies. In a separate bowl with a mixer beat butter and sugar until fluffy (3-4 minutes). Add applesauce, water and maple syrup and beat for another minute. Slowly add flour mixture and beat until you have a smooth dough. Divide the dough in half and wrap each half in plastic wrap. Refrigerate for an hour until firm enough to roll. Roll dough on a slightly floured surface until it is 1/4″ thick. Flip dough between each roll. The warmer the dough gets the harder to cut out. If it gets to warm to work with put it back in fridge for ten minutes. After rolling dough cut out and place on parchment lined cookie sheets. Put cut out cookies in refrigerator for 10-15 minutes then bake 12-15 minutes until golden brown on top. Move cookies to cooling rack and cool completely before icing. Whisk all ingredients until smooth. Glaze on cookie with back of spoon or brush. Will need at least 30 minutes to set. *I wanted the glaze to be white so I used water but it was a little on the thin side. I have use almond milk in the past and it was thicker and tasty! Gallery | This entry was posted in Anzia's picks-a young vegans perspective, dessert. Bookmark the permalink. 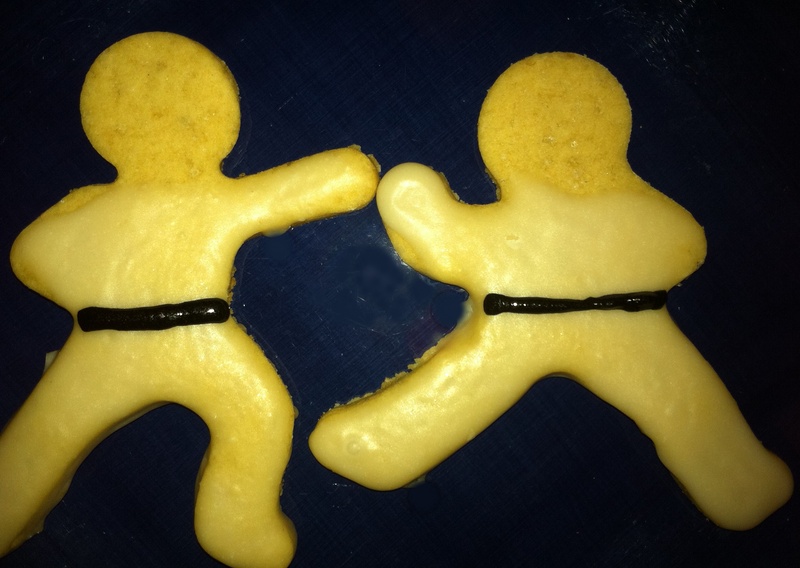 I have these same ninja cookie cutters and really like the idea and sound of these biscuits. So thank you!